Who do te all like better - Annabeth Chase o Hermione Granger? Before I started Leggere the other commenti I was undecided, but after Leggere what all the Annabeth fan have to say I have defiantly been convince that I like Hermione better! Let's start then,I've been a fan of both series but I gotta say Annabeth wins this one. Look,in the PJO series,remember where Morpheus (The God of Dreams) makes all the people in Manhattan sleep? Well,the demigods didn't got affected da it. Also the time where Kronus tried to stop time? well a bunch of demigods didnt got affected.Silena Beauregard (Aphrodite's daughter) actually mentioned that "Demigods are resistant on magic". ON the Crossover "Demigods and Magicians" Carter and Sadie Kane's magic doesn't work on Percy and Annabeth. That one fact,Hermione's trump card is out of the way. Hermione is also very cunning but she's only good on long-ranged combats. Annabeth on the other hand is the daughter of the Goddess of Wisdom herself, and as a demigod,she was trained to defend herself since seven. This is only an opinion based on facts that I know.You can add più information if te think it is wrong. Anna isn't smarter. Hermione is smarter, because she 'spoke, as usual, as though she had swallowed a textbook.' Beauty and youth don't matter. Hermione was 12 (near) when she started Hogwarts. Emma Watson is also very pretty! Yeah, Annabeth is the f-ing daughter of thena. She definitely wins there. Hermione was extreamly brave. She erased her parent's memory of her. She risked her life too. Annabeth did most of that too and MUCH più things. Anna-beth, maybe te should actually try formulating an argument instead of just saying something without evidence. It's getting really annoying! Really, I think it's a tie. We all have opinions, I know, but if it came to it, they'd be best friends. Annabeth is smart girl. She is firece too, faced her share of challenges. (Titans, Hera, intestinally challenged cows) She's pretty, as Percy says. She's one awesome gal. The two are evenly matched. :) Don't hate, apreciate. They're are both equally brilliant and powerful girls. Annabeth is Ribelle - The Brave and intelligent, Hermione is too! They're both the main heroines and therefore are both amazing. I can't choose. Oh and too people who argue over who is better, GROW UP! Stop arguing over two characters. Don't judge people because they like someone better. Just leave them to their opinions. To be honest i Amore them both and they are both cena nice. They are both smart and successful. They are beautiful from the inside out! I think they are equal! I Amore your answer Annabeth1997!!! anna-beth, maybe te should try formulating an argument with evidence instead of just stating something. It's getting REALLY annoying! In the end, Hermione won. She is just my preferito female character in everything, successivo to Bellatrix. What's not true? Bellatrix did do all that stuff. te keep on saying things aren't true when people defend Hermione...when they actually are true. I have to say that i like Bellatrix too. Sure, she's evil, but she's one of the few strong evil female wizards in HP. As a reader I like her, if she was real I would not. *Annabeth helped her Friends too. For some reason, people can only remember Hermione helping Ron and Harry. *Hermione would be nothing without her wand. Hermione is a genuis. They're even. Hermione punched Draco. She's not a weakling. STOP saying Hermione would be nothing without a wand! Annabeth would be nothing with a wand. She would also be nothing if her mother wasn't Athena! It's like in maths te can't subtract something form one side of the equation and not the other. That makes in in-equal. Also, saying Hermione would be nothing without a wand is as bad as calling someone a Mudblood! But yes, without a wand Hermione would still be smart. It's like taking away Annabeth's weapons, she would still be powerful, wouldn't she? Wait Nargles_ you're saying Annabeth would be nothing if her parents didn't exist well that's true I guess same with Hermione though. Pretty sure she can try and learn non verbal and wandless magic; bet te she can do it. to easy Annbeth da far(no effence hp fans) annabeth is smarter cause she is the daughter of athena goddess of freaken wisdom she is hotter i even had a crush on her once and she has a great boyfriend perseus jackson omg annabeth is way better yes yes she is!!!!!!!!!!!!!! I think it's annabeth chase because she's the daughter of Athena, the goddess of Wisdom so annabeth must be very wise. I think we've established that both characters have their merits and in different circumstances they can both be extremely badass. Would Annabeth be useful if her mother wasn't Athena and she wasn't a demigod? Stop taking Hermione's ability to use magic out of the equation. Also Annabeth wouldn't be useful WITH a wand. why do people compare hermione with fighting, the whole point of harry potter was Amore and compassion no the brutality of the war. hermione is a brilliant girl, who is utterly a genius. if there was no war, who would be più successful? hermione, no doubt. No Annabeth has that awesome laptop, and she is just as smart as Hermione. Also physically I feel it's unfair that people can compare 1 punch, punzone to taking a poisoned dagger for someone else. ANNABETH! Hermione just uses BOOK KNOWLEDGE. Annabeth uses EXPERIENCE AND BOOK KNOWLEDGE! Annabeth actually tries to think in a scenario but Hermione uses whatever she learned from a book. Memory doesn't mean your smart. What's not true? Hermione is both logical and has save the world. thinking in a scenario? yeah when she was 12 she did that. when she going to get killed da the devil's snare! I don't know who to pick. I guess annabeth. I feel like she is a slightly better hermoine. And don't get mad at that because hermoine is great, it's just I guess annabeth seems better. The reason, this is so hard is because, while annabeth is smart because her mother, hermoine is smart because that is her choice. Annabeth, though though so is hermoine, is also beautiful. I'm pretty sure that's big if the goddess of beauty tells te so. And for te guys out there saying that hermoine is still strong without a wand, I'm sorry but but not really, she just hit Draco who I'm pretty sure wasn't prepared. And while hermoine is amazingly brave, annabeth took on a Titan with a broken arm, held up the SKY, and way more. Not to mention running away at seven. I LoVe hermoine, and I'm thinking Rick riordan based Percy and annabeth on Harry and hermoine(I'm all for Ron and hermoine though.) and yes annabeth has flaws aswell, jealous, prideful, annoying, and sometimes a little to smart, I'm just picking annabeth. Also while hemoine is smart, annabeth is smart AND wise, those two words are a big. I could probly go on all giorno about this but I'm sick, and going to the doctors. i can see your point! i like them both so much i could not chose. It's kind of funny that people are saying that Hermione would be nothing without a wand. Annabeth would 'be nothing' if her mother was not Athena. Annabeth is a demigod and Hermione is a witch. Also, why are people saying a character is better based on looks? That's just vain and stupid. Both Hermione and Annabeth would probably be aghast at hearing they were being judged my that. The domanda is not who would win in a fight. It's who do te like better. In my opinion both characters are brave, intelligent and loyal. But, I find that Hermione has più depth and is più of a unique and realistic character. So she is probably my favourite. Probably... As for who would win in a fight, it really depends on the circumstance; either could beat the other. Although the Percy Jackson universe and the Harry Potter universe have different rules and from them to clash wouldn't make sense. Something that is normal in HP might be extremely powerful in PJ and vice versa. P.s. I hope what I have written makes sense as I tend to be repetitive, have sentence that go for to long and assume that the reader knows every thought I have. I disagree with your first paragraph. If te take away Hermione's wand she can still use her wits, but if te take away Annabeth's mother she wouldn't have anything. If they were in a battle te would have to take away Hermione's wand and Annabeth's weapons, but still allow them to use their knowledge. I personally can't decide who is better. I think that Annabeth may be smarter, but she is the daughter of Athena after all. Hermione may be nicer at times. They both start off kind of annoying to the main charachter, but end up better as they get older. If they were to meet though, I think that they would be friends, if Annabeth could look past the fact that she was a wizard, and vice versa. If te took away Annabeth's mother she wouldn't be alive.... Also she would still be skilled with a coltello and extremely brave. yeah i suppose if te took away annabeth's godliness and hermione's magic skills then they'd be nothing. That's what I like, Hermione doesn't have to be a tomboy to be strong. It's stupid how in YA girls have t o be a tomboy. She's original, and Annabeth is just a copy of Hermione. Hermione is neither girly nor a tomboy. te are both wrong! Annabeth is not a copy of Hermione! She is più athletic and prideful they look completely different and Annabeth is also less emotional. i get redbrian's point but still, annabeth cries and the reason hermione cries più is because her parents didn't know her before! i bet te in the philospher's stone she was used to mean comments, its just she had dato up entirely on making friends. annabeth is not a tomboy. they both have good points as well as bad. Annabeth Chase.She's cool and much più smarter than Hermione!She can fight monsters,and what's hermione done?Got passed a stupid potions problem! Hermione. Annabeth doesn't interest me that much, but I actually like Hermione's character. Actually, i really think Annabeth is just Hermione. I'm not saying she's a "cheap ripp-off" o anything, they are literally just the same person. And as we all know HP came out WAY before PJ. So every time i'm Leggere PJ and Annabeth is doing something, i just see Hermione. They both are really intelligent, Ribelle - The Brave and kinda lonely. Also Percy and Harry are like almost the exact same person. And i mean, look a the first book, almost the same basic story. Boy who doesn't knows anything about his powers goes to place to control his powers, gets best Friends with a girl who is obviously più intelligent than him, needs to get a special, powerful object away from the bad guy who needs that object, to regain his powers....Oh, and there's a three-headed dog. Same story? I thought so too. But yeah, i need to give Hermione that one, she needed to work hard, Anna was just born intelligent. She can't even do anything powerful, but being intelligent. Hermione at least has a wand, but successivo to that actually can't do più without it. Anyways, sorry, Anna, Hermione won this one. Can te see Hermione holding up the world? I can't, she may be Ribelle - The Brave enough but lacks in the physical strength. I prefer Annabeth (well I prefer PJ in general) but I can see how people would like Hermione better. I know everyone says Annabeth is better but please, Hermione has magic. Everybody says that Annabeth is better physically but can I ask te a question? Other than her punching Draco, have te seen her fight? She is a non violent person so we will never really know. And smarts? 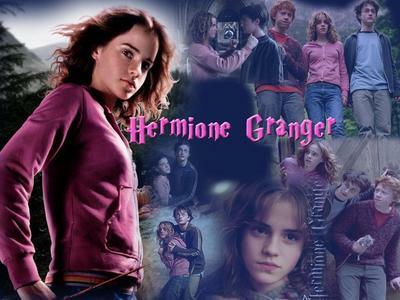 Hermione does not just have a memory; she knows the best things to do in a situation. Same goes for Annabeth and she reads books; like Hermione she has a thirst for learning.